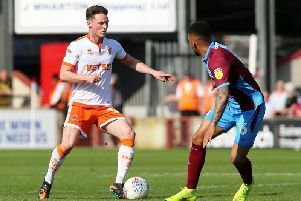 Former Manchester City youngster Adam Drury has been handed a trial at Blackpool and made an immediate impact on the day Nile Ranger returned to the club. Right-back Drury scored in yesterday’s 2-2 draw away to Morecambe, a friendly played behind closed doors. The 21-year-old, who spent five years at City, has had trials with Leeds and Bradford this summer after leaving the Premier League big guns at the end of last season. He failed to make a senior appearance for City and spent the first half of last season on loan at St Mirren. Drury does have some Football League experience following a loan spell at Burton three seasons ago. He played the whole of yesterday’s friendly alongside fellow triallist Jim McAlister, who was again give the chance to impress as a second-half substitute. Striker Ranger was not involved in yesterday’s game but The Gazette understands he did report in for training earlier in the day. It is exactly eight months since Ranger went AWOL – he had stayed away from the club since playing in the 1-1 draw at Rotherham on November 29. In the interim, he described his Pool contract as a “joke” which left him “struggling to fill my fridge”, and then expressed incredulity when the club chose to extend that contract for a second season. However, after talks with new manager Neil McDonald last month, it was agreed the 24-year-old would return to Bloomfield Road. Ranger was due to resume training 10 days ago but turned up for the first time yesterday. The club is yet to confirm his reappearance but Ranger could even be involved in Friday’s final pre-season match at Accrington Stanley. His return could be a boost for McDonald, whose squad remains thin and whose recruitment drive looks set to go right to the wire, with the season just 10 days away. Former Wigan defender Emmerson Boyce, who has been on trial with the club this week, wasn’t involved at Morecambe. MarkCullen scored the only goal of the first half for Pool, while the Shrimps’ equalisers came from Lee Molyneux and Kevin Ellison. Blackpool team: Doyle (Letheren 45), Aldred, Jones, Robertson (Higham 45), Ferguson (Dunne 45), Drury, Potts, Oliver, Osayi-Samuel (Cameron 44), Redshaw, Cullen.